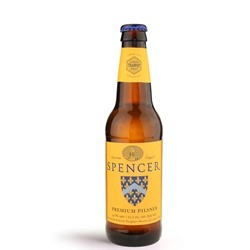 Spencer Premium Pilsner (ABV 4.7%) is the world's first Trappist Pilsner. Straw colored with a dense, creamy white head, it's brewed from pure Pilsen malt, German noble hops and fermented with classic lager yeast. It is remarkably clean, crisp, and refreshing. The brewery's original name for this beer, "Feierabendbier", literally translates as "celebration-after-beer" but more commonly means "after-work-beer", or more poetically, "well-deserved-beer". The name is derived from the German tradition of closing the workday together by sharing a light, refreshing beer. Larry Littlehale, the Spencer Brewmaster who trained, studied, and brewed for decades in Germany before joining Spencer Brewery, introduced the monks to the feierabendbier tradition as a 'sometimes event' at the brewery and as a simple way to honor the manual labor so fundamental to Trappist monastic life. 12 oz. bottle. Spencer Brewery is a project born of tradition and necessity. For over 60 years, the monks at St. Joseph's Abbey have cooked and packed jams and jellies at their monastery under the Trappist Preserves label. This business has supported them, while providing wholesome monastic work and charitable assistance to persons in need. However, looking to the future, they saw a need for an additional enterprise that will support their community and charities in the years to come. Just a few years ago, one of the brothers expressed interest in brewing and even did some training at a local craft brewery. Over time, his passion for brewing affected some other monks, who recognized that brewing was a very traditional monastic enterprise. Thus, when the time came to re-chart the economic path for the monastery's future, the idea of a brewery gained traction. With the blessing of the abbot, they embarked upon a two-year data-gathering mission. They visited each Trappist brewery to learn everything they could from their European brothers. Beginning at the Abbey of Westmalle, they slowly made their way around Belgium, staying at the monasteries and making friends, receiving good advice and drinking some of the world's best beer. The final stop of their first trip was the Abbey of Sint Sixtus, brewer of the acclaimed Westvleteren ales. By the end of their second trip and more detailed discussions, they were confident that they had put together a realistic plan for a new brewery. Following monastic tradition, the monks voted and confirmed the project by an overwhelming majority to build America's first Trappist brewery. Observing Trappist tradition, they named their brewery, and the beer, Spencer after their beloved town of Spencer, Massachusetts.